The first Megalosaurus bones were discovered in England in 1676. People didn’t know what it was. At first, they thought it was a Roman war elephant. Later they decided it was the bone of a human giant. In 1815, more bones were found and scientists realized they weren’t from an elephant or a human, but from something like a giant reptile. The Megalosaurus was given its official name by the Geological Society of London in 1824. Prince Albert commissioned a huge glass structure built in London, the Crystal Palace, which housed curiosities from around the world, including several dinosaur statues, such as the Megalosaurus. The palace is gone now, but there is a park there still. Scientists have never found a complete skeleton of this dinosaur, but they do know that it walked on its hind legs. It was a carnivore and had sharp, serrated teeth. It could probably run quickly and it was probably one of the smarter dinosaurs of its time. It weighed as much as a black rhino. Torvosaurus in North America is a type of Megalosaurus. Question: Why did people think the Megalosaurus was an elephant? Answer: When the bones were discovered in a stone quarry, the people were confused about what those bones might be. They looked nothing like any animal living in England at the time. The Romans did bring elephants to England, which seemed a likely explanation. Many myths, such as dragons, were probably created to explain dinosaur bones. 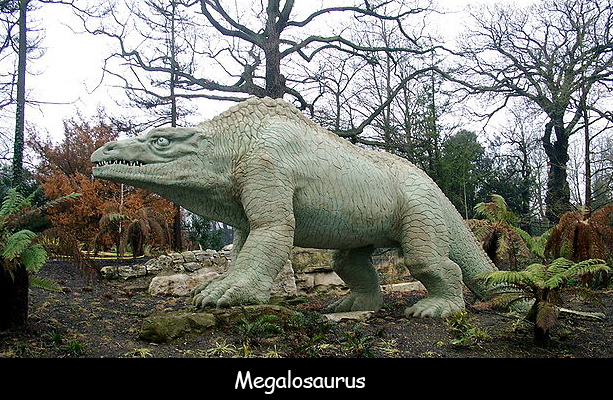 Read more facts about the Megalosaurus. Declan, Tobin. " Megalosaurus Facts for Kids ." Easy Science for Kids, Apr 2019. Web. 21 Apr 2019. < https://easyscienceforkids.com/megalosaurus/ >.